It is always important for the teachers and parents to read children’s literature themselves, understand the effectiveness of extensive reading and create an appropriate environment for children to read books. This article presents the existing teaching reading culture to young learners in Nepal and ideas for teachers and parents to provide opportunities to read and support their children’s learning. Several studies have been done globally in the field of language teaching regarding the importance of the use of children’s literature for their learning. However, in the context of Nepal’s public primary schools, this is a very rare practice. (Koirala & Bird, 2004: 128). Koirala and Bird (2004) mentioned that the culture of reading for pleasure is very limited in the context of Nepal. It does not mean that people do not read books or other publications. The government has invested a large amount of money in primary education and showed a willingness to reform the education system. However, the education system is conventional, and it needs to be transformed to meet contemporary global education. For instance, the government provides textbooks for the school children and the children follow the texts and instructions of the textbooks which they have to do for getting promoted to the upper grade every year. There is a rare access to the library of reference books and additional reading materials for the children in schools, and neither the schools (excluding few schools, having managed fund for the library), have managed resources to develop a library in their schools. Although some international organizations such as Room to Read and Nepal Library Foundation have been working to enhance educational opportunities through public libraries by donating English as well as Nepali story books in rural communities, their work in limited areas is unlikely to reach every corner of the country and most of the children in Nepal are still far away from such opportunities. Unless the government invests massively in education particularly in providing learning resources, the current support for the schools by a limited number of non-governmental organisations may not result in the immediate change in the traditional culture of reading. In addition to this, a lack of awareness among teachers and parents is another obstacle to foster a reading culture of children. For instance, when a question is raised about reading culture at home and at school, the majority of Nepali people consider reading means reading prescribed textbooks and understanding a text refers to enabling children to answer the questions based on the text. Moreover, it is a general tendency of the people that they tend to treat their children in the same way once they were treated. In addition to this, the education system in Nepal lacks a holistic approach to teaching and learning a language and it is focused on teaching one aspect of language at a time in isolation entirely based on textbooks in general. For instance, the students are taught Nepali or English alphabet in preschool which can take over a year as it has no meaning for the children. Similarly, the students may know prepositions, but they have no idea of presenting it in context and it takes many years for them to internalize and use language in their everyday life. Beard’s (1991) study in children developing literacy found that a fundamental support of parents and teachers can help children set up their learning goals. Therefore, parents and teachers need to feel that young learners need exposure to develop their reading habit which serves as a vehicle to make a tremendous difference in their language development, intercultural understanding. When I was a teacher trainer at one of the organizations at Kathmandu, I worked in a training project ‘Bringing English to Classrooms’. During that training period, I conducted some story-based activities to provide the teachers with hands-on knowledge regarding the effectiveness of using literature throughout the curriculum. Teachers also wrote stories themselves for their students and made books using the local materials available. The teachers enjoyed a lot in my sessions and seemed to believe that stories can play a powerful role in language learning. However, in the beginning, many of them were not sure if they could take what they learned in the training centre. They came up with questions such as ‘how is extra reading possible while both teachers and students are busy completing the course syllabus fixed by the school administration and preparing for exams?’ So, it was still challenging to persuade the teachers that reading widely does not mean it has to be separated from their everyday task based on the syllabus but the two can be integrated. During our monitoring phase, I found some of my trainee teachers who implemented what they had learned and some of them were still not sure how it would exactly work in their school where they still lacked enough books, time and concrete ideas. From the training programme, I learned that some teachers could not transfer the skills they had learned from the training to their classrooms. And the limited time the project had did not allow me to go for regular mentoring. Had I got further opportunities to follow those teachers, the result would have been far better than what our project really achieved. On the other hand, the teachers who were aware and who could internalize the process succeeded in implementing what they learned. It made me believe that it is possible for the teachers to establish a new culture if the teachers are aware, self-motivated and are mentored carefully. Why is child literature important? Literature not only helps children learn to read but also helps them develop an appreciation for reading as a pleasurable aesthetic experience. Likewise, a team of researchers (as cited in Pantaleo, 2002) claimed that “literature entertains, stretches imagination, elicits a wealth of emotions, and develops compassion.” (pp. 211). A piece of story stimulates readers to generate questions, can give new knowledge and provides encounters with different beliefs and values. Good stories can work as a powerful device to show children right direction, help them make decisions, learn to empathize and become good humans. It can change their perception and attitude towards certain things. For instance, from the story ‘The Grouchy Ladybug’ written by Eric Carle, children learn the importance of being friendly and interacting politely with others in the community. Literature also opens the springboard for discussions. For instance, after reading ‘The Giving Tree’ children can discuss for hours regarding human development, their behaviour, selfishness and so many other issues. Thus, using literature is a natural medium of teaching children a second language, developing a love for literature in the learners and motivating them to read and grow as a ‘human’. Why extensive reading across the curriculum and what teachers can do? An act of reading extensively is likely to produce positive attitudes and interest towards reading. Materials, which are interesting at the appropriate linguistic level, always motivate students positively. Such materials give pleasure and generate interest in reading and support language learners to develop their overall language skills and progress academically. Day (1997) compares the pleasure and achievement the students get from extensive reading with a garden where it is always spring. Children’s literature or real books used in language classrooms and across the curriculum also contributes to foster their lifelong reading habits, good problem solving as well as decision-making skills (Ghosn, 2013). The more children get to read books, the better speaking and writing competence they acquire. In this regard, Harmer (2001:251) argues that “what we write often depend upon what we read” and so do the children as they draw attention to the structure of written language and begin to internalize its distinctive features of language when they read or listen to stories. Thus, they also learn to speak simultaneously when they get to participate in the activities where they require speaking skills such as dramatization and making predictions. Therefore, it is very important for the teachers to read books, promote reading and give children enough opportunity to interact with books by surrounding them with good texts in the school. It becomes easier for the students to understand the concept of the curriculum content and it broadens the horizon of their understanding if they get to participate in such activities based on stories. For instance, children have fun by listening to the story; ‘The Very Hungry Caterpillar’ and simultaneously they get the concept of the lifecycle of a butterfly. Thus, through the practice of reading extensively across the curriculum, teachers can encourage young learners to read and have the love for literature. This way, the teachers can scaffold them to acquire competence in language as well as the subject content. Teachers can start collecting reading materials through various sources or develop stories themselves working collaboratively in co-ordination with the headteacher despite the difficult circumstances with lack of resources. Most importantly they should be aware and make themselves familiar with child literature. Teachers can make a difference in the language classrooms for young learners if they have a good selection of stories with beautiful pictures, various sentence structures and repetitive patterns and stories that represent a various culture of Nepal. Therefore, the teachers need to realize it is important to maximize reading opportunities in school and encourage parents to read to and/or with their children at home. *Ms Chapagain is working as a freelancer teacher educator. 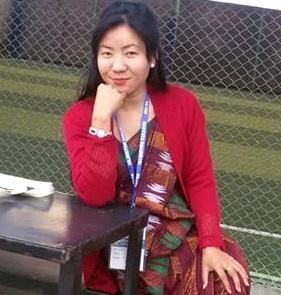 She earned her Master’s degree in English Language Teaching (ELT) from Kathmandu University. She has also completed MA in ELT (with specialization in Young Learners) from the University of Warwick, the UK as a Hornby Scholar 2014/2015. Beard, R. (1991). International perspectives on children’s developing literacy. In C. Brumfit, J. Moon and R. Tongue (Eds. ), Teaching English to Children: From Practice to Principle. Collins ELT. Day, R.R., & Bamford, J. (1997). Extensive reading in the second language classroom. New York: Cambridge University Press. Harmer, J. (2001). The Practice of English Language Teaching. (3rd Ed.) Longman: Pearson Education Limited. Longman: Essex England.